Collectors and art-lovers are such an important part of how we keep track of a painting’s history and provenance, and we’d appreciate your help with this one. Created between 1959-60, this watercolor is set in Egypt. 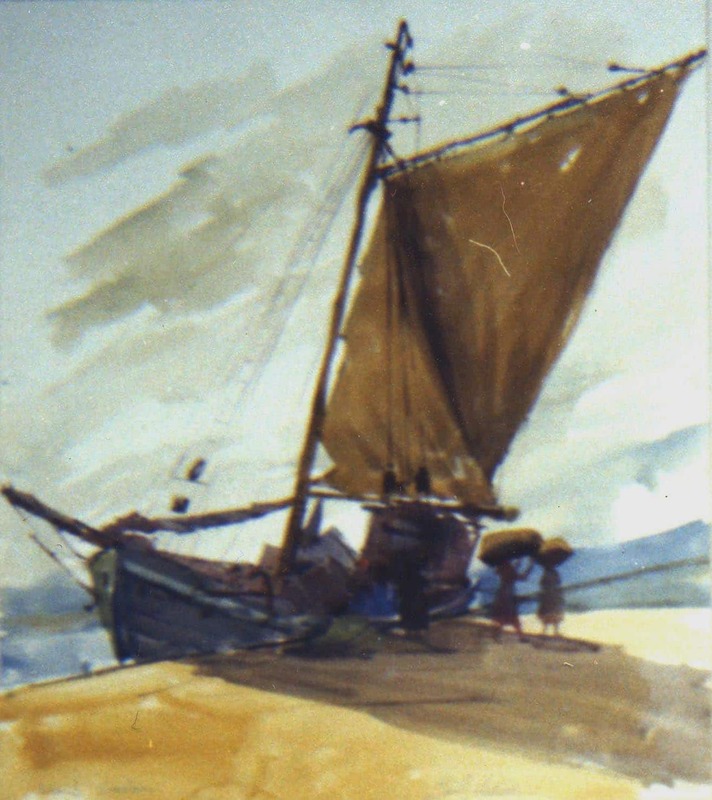 When Hulings was making the transition from illustrator to easel painter, he spent several years studying and traveling from Norway to North Africa and all points between. Hulings had wanted to visit Egypt since he was a teenager: he’d been inspired by the Middle Eastern settings in Dean Cornwell and Frank Brangwyn’s paintings. He braved a trip in a politically fractious time; in true adventurous Hulings fashion, he was by himself, and driving an Opel car with German plates—when memories of World War II were still fresh. Some of his most notable watercolors were created in this era, in part for the practical reason that they dry more quickly than oil—a concern for the world-traveling artist. Hulings was also quick to point out that the medium requires serious skill and shouldn’t be overlooked. This ship could be in Luxor, the setting for a few other Hulings works from this era that feature sailboats. Even with the poor quality of this image, you can see the dynamic composition: the diagonal line of the “bowsprit” at the front of the boat cuts across on the lower left, and the rigging at the top of the sail, the “yard,” is an opposite diagonal on the upper right. If you look carefully, you can see three figures unloading the cargo onto the dock. If you know where this painting is, please send us a note, as we’d love to have a better image for our archives, and to understand the journey it has taken over the past half-century. We hope you had a wonderful Thanksgiving yesterday! We’re grateful for our wonderful community of Hulings fans.